There is nowhere better to experience the awakening spring in several regions of the Earth at one and the same time. 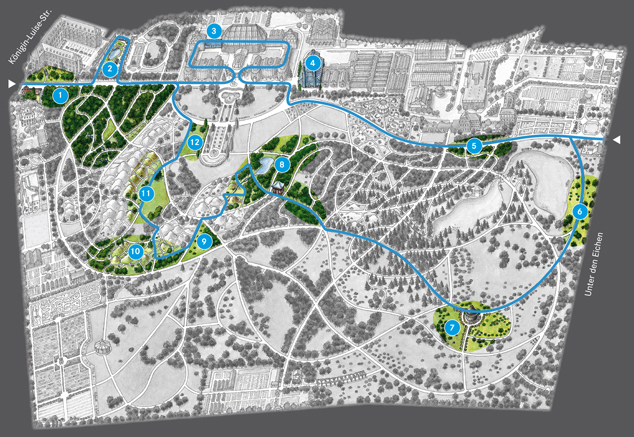 By following our suggested route, you will discover the plants and parts of the Botanic Garden that are now at their most beautiful. 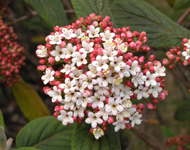 Of course you will also find delightful plants that are in bloom and well worth seeing in other parts of the Garden too. 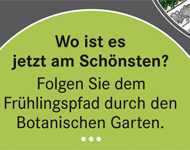 We wish you a pleasant trip through the plant world. In and around the woodland dense with European Beech trees, you will already be greeted at the start of spring by a sea of early bloomers, which only have sufficient light for flowering and fruiting before the trees are in leaf. 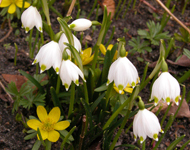 First to flower are the snowdrops, Winter Aconites, Christmas roses, Spring Snowflakes and hepaticas, followed shortly afterwards by the Wood Anemones and Spring Vetchlings. 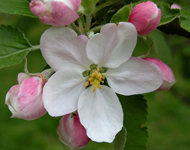 We recommend that you wander the length and breadth of the woodland and enjoy the riot of flowers. On the fringes of the wood, by contrast, you will be enchanted by Spring Pheasant’s Eye and pasque flowers, which have become rare in the native flora. In the aquatic and marsh plant garden, coltsfeet, primroses and kingcups are now in bloom. 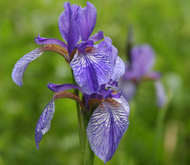 Later in May irises, orchids and Ragged Robins can also be admired, accompanied by a chorus of frogs. In the greenhouses it’s always high season. 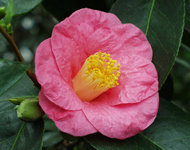 A particular attraction right into March is the blooming of the camellias and rhododendrons from East Asia. On the citrus trees blossoms and fruits are often to be seen at the same time. 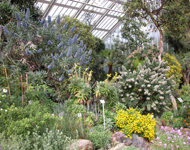 In the Mediterranean Greenhouse, experience spring on the Canary Islands and around the Mediterranean with a display of Viper’s Bugloss, Dragon Arum and Giant Fennel in full bloom. Numerous early bloomers such as the Virginia Bluebell and the Trillium create a magical carpet of flowers in the North American woods. 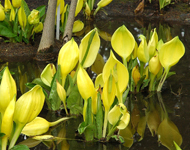 In the North American Marshland and Cypress Forest the great yellow bloom of the Western Skunk Cabbage, which grows in water and has a pungent smell, is a spectacular sight. 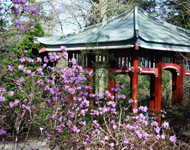 Blooming shrubs such as forsythia, viburnum, lilac and weigela border the path that continues on through the arboretum towards the rose pavilion. Around the rose pavilion you will be met by the sight of a host of blossoming fruit trees, including cherry, pear and apple, all of them members of the rose family. Compare the similarities in the arrangement of their flowers. 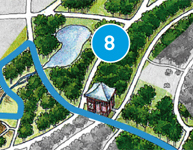 On the way to the Japanese pavilion in early spring you will come across the Amur Adonis and the Asian Skunk Cabbage. Drumstick Primroses gleam in the distance. In the Japanese and Chinese woods, witch hazels are the first to bloom, followed by magnolias, wild cherries, rhododendrons and finally Tree Peonies. A curious sight is the flowering of the Dove Tree or ‘Handkerchief’ Tree. 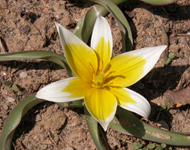 At the height of spring the numerous species of wild tulips from the Central Asian steppes create an enchanting spectacle with their variety of colours and forms. 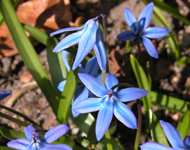 They are the ancestors of our beloved garden tulips. Springtime is particularly attractive in the mountains of Anatolia and Greece, in the Caucasus as well as in the Balkans. 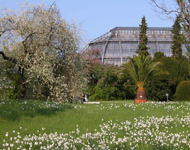 The slopes are abloom with Sibthorp Primroses, Myrtle Spurges, crocuses and squills, making it easy to forget one is in the city of Berlin. 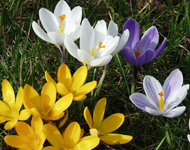 At the foot of the Alps, a lush crocus meadow in full bloom offers a dazzling frenzy of colours. Don’t miss the stunning view from the ‘summit’. 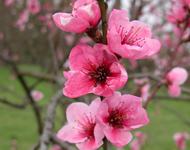 At the end of the tour, enjoy the wonderful sight of the greenhouses behind blooming Poet’s Daffodils on a meadow presided over by an old St Lucie Cherry tree.